I wanted to share today how to make one of my favourite things - Rosewater! It might not sound like much, but rosewater is the most versatile, useful product ever! You can use it as a baking ingredient, mixed into cakes or icing. You can add a few drops to a glass of prosecco, or a spritz in a cool glass of water. As well as food and drink, you can also use it for a variety of beauty uses too - as a toner, to remove make up, as a bath oil or even as a cooling down spray on a hot day! There are literally hundreds of uses for rosewater, so I'm excited to share with you how to make it at home! Oh before we start, just one last thing! Rosewater is soothing, antiseptic and anti inflammatory so it's perfect for any skin type! The first thing you'll need to do is collect some rose petals, and rinse them under the taps to get rid of any bugs. 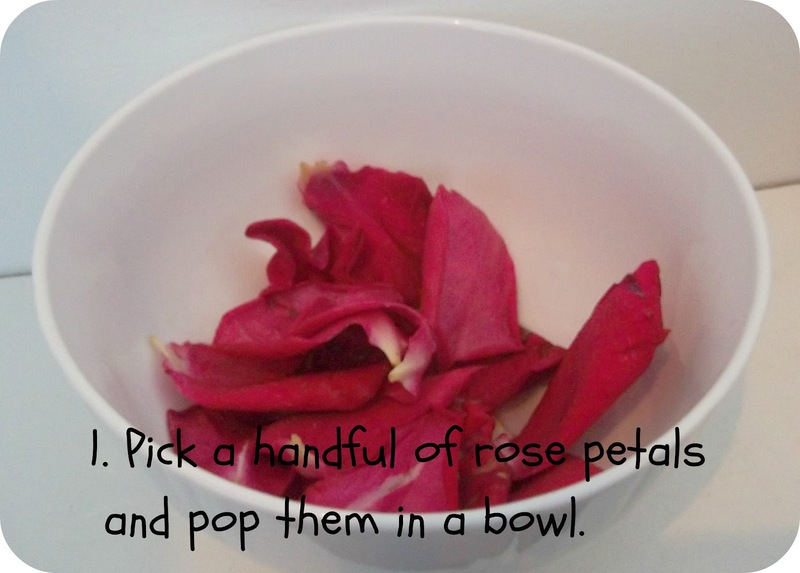 You'll then want to pop the rose petals in a oven safe bowl and cover them with water. Make sure you don't fill up the bowl, just use enough water to cover them. Next you'll need to bring a saucepan partly full of water to the boil, and pop the bowl of rose petals on top, making sure the saucepan water doesn't get into the bowl. Turn the heat down and leave it to simmer for 20-30 minutes. Once the liquid has cooled, use a sieve to separate the liquid and petals. Pour the liquid into a spray or glass bottle and you are done! If you make a lot of liquid, you can store the excess in a glass jar in the fridge until you need it! Have you ever used Rosewater before? Hi Sarah! I just stumbled across your blog and I'm glad I did! I've ALWAYS wondered what the heck rose water is for and now I know! I'm bookmarking your page ready for when the roses in the garden bloom! I would have never thought to use it to remove makeup!! How clever! What a great idea! Pinning this. Also, I'd love if you'd come join my How To Tuesday link party, too. Love this! Thank you for linking up @ Monday Handmade LInkup Party. Hope you linkup again!! How great to know how to do this properly. When I was a kid, every year me and my friends would fill jam jars with petals, add water and leave them for weeks on end. Then we would wonder why we had jars full of stinky slimy stuff instead of beautiful scented rosewater! I actually never wondered if this was something you can do at home, good to know you can.